So you want to get professional portraits of your children or family, but how do you choose from the multitude of available photographers? First, find one you feel a connection with. I have two children, a nearly 7-year old and a nearly 1-year old. I know that for most children, family photos can be more dreaded than the dentist. They want to run, play and explore their surroundings, not stand still in countless poses with forced smiles. I do my best to make the sessions fun for you and your little ones. I keep the photo session moving by changing the scenery, alternating family members, letting children play in between poses and working to achieve poses that are natural and playful. I also know that sometimes, no matter what we try, children will be children. Smiles and laughter may turn into screaming and tantrums. Every photo may have one child that's frowning or looking away from the camera. Little ones may have stranger danger and be afraid of me throughout session. This is where I use my expertise and editing magic to transform your photos into the beautiful family photos you hoped for. I work to change those frowns into smiles, whether during the session or in post-processing. I want you to have beautiful photos you can hang on your walls and share with your family. No matter what complications we encounter, I work to get a variety of natural interaction poses and more formal family shots. To me, family is love, caring, challenging, rewarding, messy and confusing, but something I wouldn't change for the world. 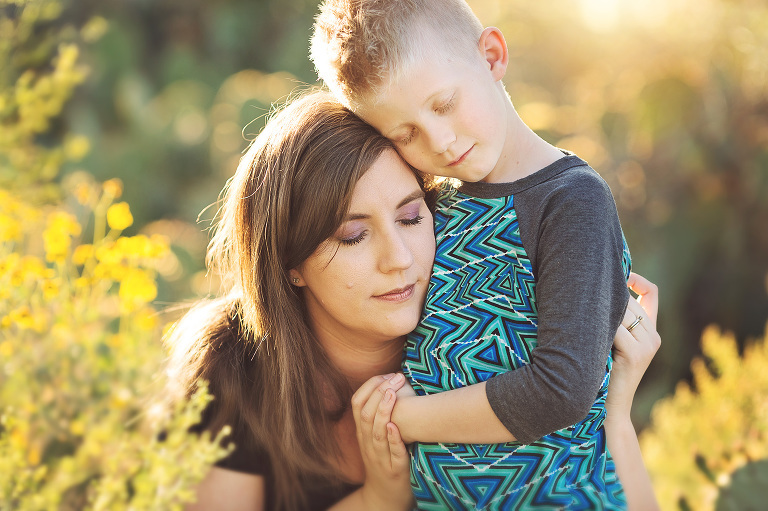 In the time we have for your session, I want to capture all of your family moments. All of the happy, fun, messy, moody and loving moments I can. Children grow so fast it's important to photograph them at every stage. There may be times you just want images of your children, and that's wonderful. Children's sessions are fun and can capture so many of their changing expressions and personality. I love working with children, no matter if it takes 30 seconds or 30 minutes to get a smile from them. Whether your babies are still in diapers or have children of their own, the session will be tailored to letting them express themselves in their own time and special way. During your consultation we will discuss your child's personality, fears, favorite things, and how best I can help them to relax and have fun during the session. Things to bring to your session are their favorite toys and games, their favorite songs, or their favorite costume. Sometimes a little imaginitive play helps them get comfortable with new people and situations. Even if you don't plan on being in the photos, be prepared as some littles ones may need mom or dad to hold and comfort them while I shoot. These images will still focus on your child however. Once you decide on Belle Vie photography for your next family photo session, contact me via email, telephone or online. We will set-up a telephone or Skype consultation to discuss your session. Ask as many questions as you can whether about location, wardrobe or my process. 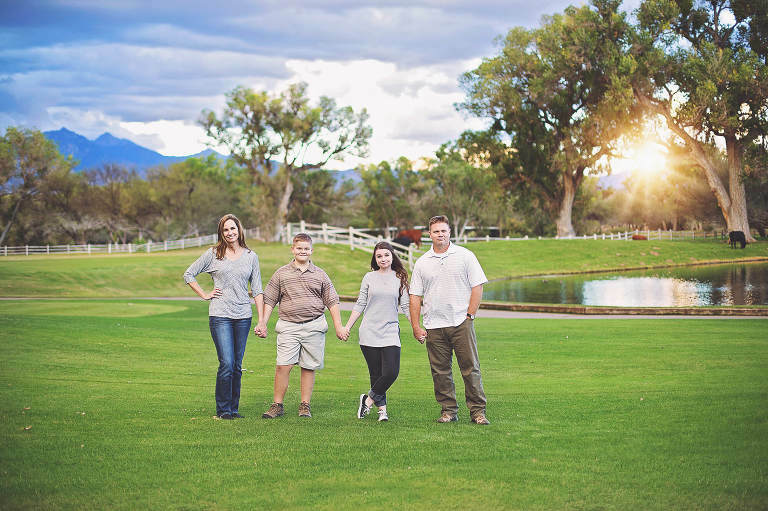 If your family has special needs or you have an artistic vision for your session, we will discuss this as well. This is your time to plan your session. We will also book a date for your session. The day of your scheduled session, we will meet at the location of your choosing about 2 hours before sunset. Your session will consist of as many shots and poses we can manage before we lose the light. If there are certain poses you love, please feel free to bring photos of those poses. If you have props you would like to use, please bring those. If your children may be uncomfortable or easily bored during the session, feel free to bring their favorite toy. Processing of your images takes 2-4 weeks. All of your images are sorted for quality and variety, and then are artfully and meticulously edited. When your images are ready, I will contact you to set up an image selection meeting where you will be able to view and order your images. Product order will take an additional 2-4 weeks depending on the product and time of year. Any digital images purchase will be made immediately available for online download. Tucson is home to some of the most breathtaking scenery in the country. From it's 150 year-old saguaros to its brilliant pastel sunsets. You will have many locations to choose from when deciding on the perfect location for your session. If you love the desert and it's one-of-a-kind scenery, we have no shortage of options for you. My two favorite are Saguaro National Park and Sabino Canyon. Both are easily accessible, are well-maintained, are populated for safety and have countless options for variety in your photos. If you would like a location that is more lush and green, Tucson has those as well! Golf courses, hotels, parks and gardens are all available here with grass, trees, flowers, fountains, ponds and even some with play areas nearby for the kids. There are also options like downtown Tucson, which boasts a unqiue and trendy urban style, or the botanical gardens. Want to get out of town? Green Valley hosts some spectacular locations like Tubac. Sonoita is a hop, skip and a jump and pairs grassy plains with rocky mountain ranges and a rainbow of pastel hues each evening. I am also happy to travel with you up to the jewel of Tucson, Mt. Lemmon. Mt. Lemmon offers diverse landscapes from rocky cliffs to colorful aspens. Mt. Lemmon is perfect when you want to escape the summer heat, have fall photos amongst the colorful deciduous trees, or opt for a winter session in the snow. If you are unsure of where to go, take a look at my LOCATIONS page. Or tell me what you are looking for and I can share with you all of our options. There are many places I have not used in the local area and am happy try something new. Coordinated variety is the best way to describe it. Colors and patterns that pair well together, but don't match exactly. You want each person to have an individual look, while coordinating with the group. Do NOT be afraid of patterns and color. No matter what location we choose, the colors are going to be monochromatic. If you choose to wear plain, solid colors, you are not going to stand out against the backdrop. I want you to stand out against the backdrop. Stripes, plaid, polka dot, lace, sequins...bring it on! Just do so sparingly. Depending on the size of your group, shoot for an even mixture of patterns and solids. Allow your patterns to guide you in choosing the solid colors for the others, but avoid matching solid colors. Let each person have their own color or a similar matching pattern. Color is good! Like I said, I want you to stand out against your background. The main colors to avoid are greens, greys and browns. Whether you choose the desert or a golf course for your location, you are going to be surrounded by green and brown. Stand out with reds, blues, yellows or pinks. Don't forget the accessories! Accessories add pop to plain outfits and bring various colors together. Statement necklaces are perfect for this. They are large, colorful and stand out in just the right way. DO avoid logos and graphics. Logos and graphic tees draw eyes to the clothing instead of the overall picture. It is distracting and detracts from the goal of a unified portrait. If you have a little one that insists on wearing their favorite superhero or princess shirt, bring something to put over it such as a jacket, vest or button-up shirt. I will work with your little one during the session. 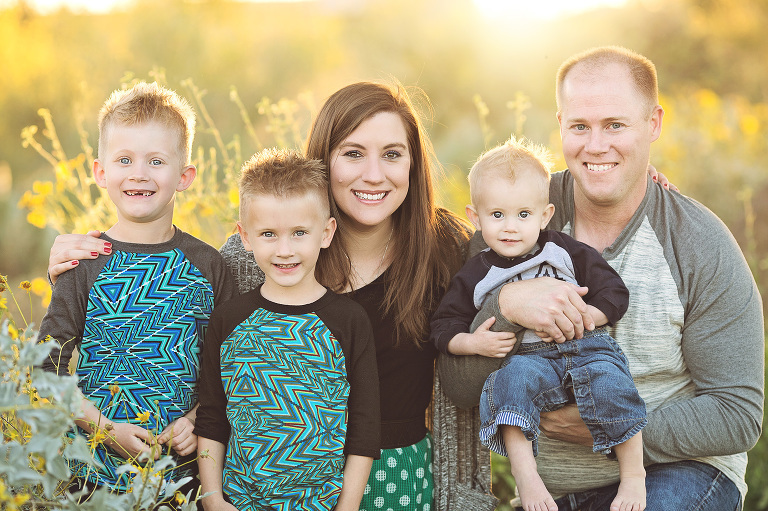 This family chose to dress in varying shades of blue and teal with pops of yellow. Each family member has their own individual look without straying from the color theme. Several patterns are being worn, but they still match and bring a unique unity to the family. Mom adorned herself with a darling yellow necklace, which ended up not only matching older brother's shirt, but the background as well.